Every year, the iSchool awards more than 30 distinct prizes and scholarships to incoming, continuing and graduating Master’s and PhD students. We are grateful to all the individual donors and organizations who make these awards possible in support of our students and their achievements. 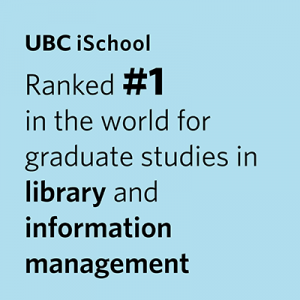 As per UBC regulations and policy, awards are available to FULL-TIME students only, unless otherwise noted. Full-time students are defined as those who are on a Schedule A tuition payment plan. Dual degree program (MAS/MLIS) students may apply for both MAS and MLIS awards, following all other eligibility requirements. Many of our awards are based on endowments and funds invested by the University. Given the current financial climate, neither UBC nor the School can guarantee that funds will be available for these Scholarships and Awards in any given year. Every August, the Faculty meets to assign “Graduating Student Awards” to students who have completed their degrees in the past academic year and to assign “Current Student Awards” to students who will be returning to the School in the Fall. GSI Awards will be awarded during the admissions process (February & June). All other Entering Awards will be assigned once both cohorts (September & January) have been set. This usually occurs in August, unless otherwise noted on the awards page. Current students will have their awards assigned once their continuing status is confirmed. This usually occurs in the September following the Faculty’s Awards meeting, unless otherwise noted on the awards page. Graduating Students will have their awards assigned in the weeks following the Faculty’s Awards meeting.